The Automotive industry is going through a revolution with innovations like driver less car, connected vehicles, electric and hybrid engines. Google and Tesla driverless cars have covered millions of miles in testing and Chinese driverless car is also ready for testing. The innovation in automotive industry is driven by rapid deployment of integrated electronics and car chip market has grown at scorching rate to tens of billions. Synopsys is taking the innovation in car systems design and verification to next level and recently announced the expansion of its VC Verification IP (VIP) portfolio with CAN 2.0/FD/TT (ISO 16845 compliant), LIN, FlexRay™, and Ethernet Audio Video Bridging (AVB) protocols for the verification of automotive applications. The comprehensive portfolio of VIP is the best verification solution for all systems of an intelligent connected automobile ranging from comfort, safety, powertrain, and camera to infotainment, connectivity, communication, memory and storage systems. 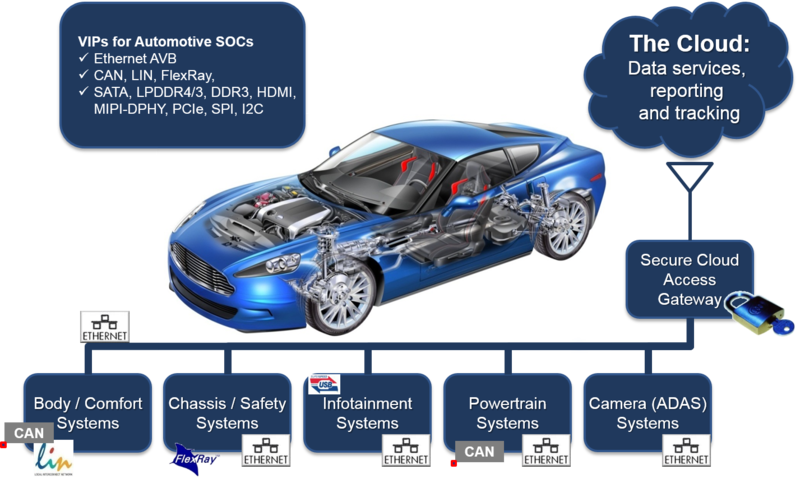 Synopsys VIP for CAN is the industry’s first VIP with support of CAN TT along with CAN 2.0/FD. These verification IP titles include test suites and spec-linking technology required to verify compliance to automotive standards. With the increase in demand for state-of-the-art integrated electronics in automobiles, Synopsys’ comprehensive VIP portfolio enables system-on-chip (SoC) teams to design next-generation electronic systems for safe, secure, smart, and connected automobiles. This post is filed under Automotive, CAN, Ethernet AVB, FlexRay, LIN, Uncategorized.